If not, let me introduce you! NORA is an infusion we recommend to our pregnant clients, made from a blend of nettle leaf, oatstraw, red raspberry leaf, and alfalfa. This delicious infusion will help keep you hydrated, nourished, and may help with some of common minor discomforts of pregnancy. We recommend drinking a quart daily, beginning in the second trimester of pregnancy and continuing while you are breastfeeding. Stinging Nettle Leaf (Urtica dioica) is one of the most nutritious plants, containing calcium, potassium, protein, beta carotene, trace minerals, iron, and vitamins A, C, D, and K. It is used as a blood builder to treat anemia and promote circulation, to increase milk supply, and decrease menstrual bleeding or bleeding after childbirth. Oatstraw (Avena sativa) is one of my favorite herbs. Not only is it very nourishing, it is calming and mood-stabilizing. Prepared as an infusion, it provides protein, is high in B vitamins (except B12), calcium, magnesium, and contains all macro- and trace-minerals in high amounts. Plus, it has a pleasant, mellow taste. Red Raspberry Leaf (Rubus idaeus) contains vitamins C, E, B2, B3, calcium, zinc, selenium, phosphorus, potassium, and iron. It is used to tone the uterus and ease uterine spasms. It is said to make uterine contractions more effective, and to increase breastmilk. It also promotes healthy bones, nails, teeth, and skin. To make an infusion, mix 2 parts Nettle and Red Raspberry Leaf to 1 part Oatstraw and Alfalfa. 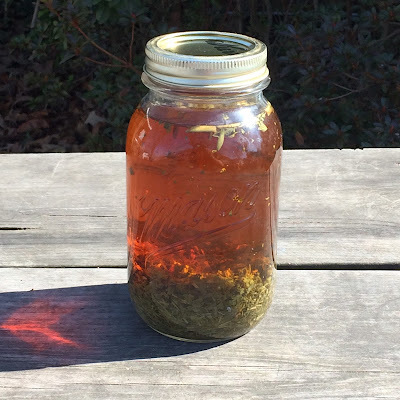 Place about an ounce of the herb mixture in a quart Mason jar, pour boiled water over the herbs, cap tightly and let sit at least 4 hours to overnight. Then strain the herbs and drink over the course of the day. Add a little honey, if you like. Deb generously provides NORA to all our homebirth clients. If you want to order some for yourself, all these herbs are available online through Mountain Rose Herbs, Frontier, or even on Amazon. What If You're Not Happy To Be Pregnant? I have a little tradition on New Year’s Day of reflecting back over the previous years, as I plan for the year ahead. I browse our photos and scrapbooks, and I read through my Facebook memories. I noticed that that on this day in 2013, my midwife was visiting our home for a postpartum visit, newborn screen, and signing the birth certificate for our seventh baby. (The Baby turned five years old a couple days ago!) There were many joyful posts and pictures of the new baby. sitting alone in my bedroom with the door locked, watching that positive line grow darker on the pregnancy test. I couldn’t breathe. Honestly, I had a meltdown. 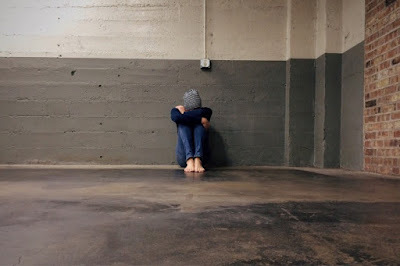 I had suffered postpartum depression with my previous two pregnancies, panic attacks with the last one, the baby had just turned a year old, and I was just beginning to see the light at the end of the tunnel. I didn’t see how I could possibly go through it all again. I felt guilty and ashamed that I wasn’t happy, that I didn’t want to be pregnant again. As the mother of a large, Christian family, I was supposed to see children as blessings, welcome a new baby with an open heart, and feel joy at adding to my family. There weren’t many people I could share my true feelings with. I mostly kept them to myself and went through the motions. The holiday season, full of joy and celebrating, is typically the time of year when we get the most calls from moms who have received a positive pregnancy test, full of excitement, hope, apprehension, anxiety, and questions. I understand that not everybody feels joy or excitement about that positive result. If you are not happy about your positive pregnancy test, I want you to know that it’s ok to feel that way. You are not a bad person because you have those feelings. You are not alone. I hope you will reach out and talk to someone. If you need someone to talk to, I am here to listen. And I promise I won’t judge.